Kevin Doran is Managing Director of EU Public Affairs at Grayling Belgium, one of the leading independent PR & PA consultancy in the world. He has nearly 14 years experience of working in and around the EU institutions and has advised blue-chip companies, international organisations and government bodies on EU-related topics. Kevin Doran wrote this article in a personal capacity and the views expressed in it do not represent those of the organisation he is working for. 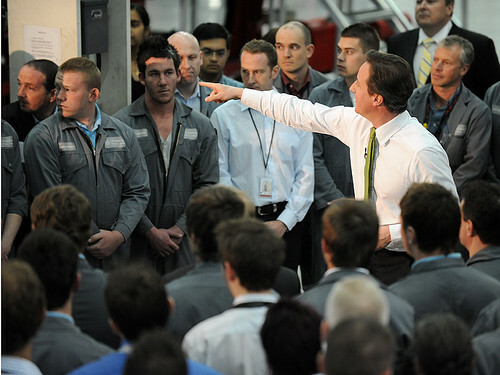 David Cameron this week led a call to arms for measures to boost jobs and growth in the single market. In a letter signed with 11 other Heads of Government, Mr Cameron says it is imperative that the single market becomes more competitive with supply-side de-regulation and economic reform. The British Government wants to see a distinctly pro-Growth agenda when European leaders meet again for their next EU Summit on 1st March and it believes that a stronger single market is key. That David Cameron is calling for an open digital market and more external trade agreements is itself unremarkable. - the UK has long been a driving force in opening up European markets and the European Commission is in any case renewing its efforts to make the single market more open and competitive. What is remarkable is that he said it at all. The Eurosceptics in his party hailed him as something of a saviour when he prevented any treaty changes to re-write economic governance rules for the Eurozone last December – and claiming he had saved the City of London from the clutches of Brussels. This week’s letter follows a series of low key meetings between the PM and other European leaders. Rather than turning his back on the European project, Mr Cameron has been busy finding the support he needs to strengthen the single market. At the risk of upsetting those same backbenchers that feted him last year for wielding his “so-called” veto, Mr Cameron is positioning the UK as a leader in the single market. The pro-Growth letter is a UK initiative and it has the backing of Italy’s Monti and Spain’s Rajoy. Germany, which is not a signatory to the letter, is all of a sudden looking out of sorts. Its leadership of the Eurozone response to the Greek debt crisis, has been implicitly criticised by the British – too slow in securing political and economic stability in Athens, too timid in building a strong enough firewall (the European Stability Mechanism) to prevent contagion to Rome and Lisbon, too obstinate in using the European Central Bank as a lender of last resort and too harsh in imposing austerity measures on Greece at a time when it is spiralling into depression. Just a couple of months after the UK looked side-lined from the European Union, it is staking its claim to lead the single market. The single market is natural territory for the British and they believe that it can unlock the growth that Europe badly needs. This month marks the 20th anniversary of the birth of the single market when the Maastricht Treaty was signed. The event was marked with a very low key event in the Dutch city earlier this month. The anniversary took place when recriminations between the Greeks and the Germans were at their height. It was not a good time to celebrate the European Union. But whatever you think of the single currency, it is not the same as the single market. Ten years of the Euro coincided with low interest rates and easy access to borrowing and now it is being tested to breaking point. Twenty years of the single market has coincided with globalisation. It has helped Europe compete on the world markets but it is a mixed bag of successes and disappointments. Twelve years ago, the European Commission launch an ambitious plan to take the single market to the next level. The Lisbon strategy, launched in 2000, aimed to make Europe “the most competitive and dynamic knowledge-based economy in the world” by 2010. Well 2010 has been and gone and we continue to lose ground to emerging economies. By any-one’s measure the Lisbon Strategy for growth in the single market had failed. Commission President Barroso had seen the writing on the wall for the Lisbon Strategy and came up with a new vision for the single market - Europe 2020 – this time, more realistic and practical. It didn’t offer the lofty ambition of being the most dynamic economy in the world but it did come up with useful targets- and the means for reaching them. Europe 2020 is in many respected a repackaged Lisbon but it does at least map out a growth strategy for the single market and make clear the responsibility that individual member states have in liberalising economic activity and compete on a level playing field with their European partners. It is just a shame that many Member States pay lip service to the Europe 2020 vision. Just as the proposed Fiscal Compact will allow the Commission to sanction Eurozone members who break budgetary and borrowing rules, it might be an idea to give the Commission more teeth in enforcing single market directives that are ignored by some governments. The single market is not a force of nature. It takes commitment and consensus to make even the smallest breakthrough. On one level, there have been real achievements in forging a single market, particularly when the number of member countries has ballooned over the last 20 years. There is a European energy market which offers choice and helps security of supply; there is a transport market which brings with it more choice and competition; there is an EU-wide market in telecoms; there is even EU markets in health and education (albeit limited); the list goes on. In each sector, there have been struggles. Vested interests do not surrender easily. Inevitably, there have been setbacks. The Services Directive was an attempt to liberalise and Europeannise a whole range of markets in the services sector but was hugely watered down in the face of member state opposition. Tackling vested interests and ensuring that national sovereignty is still somehow in tact is only part of the problem. Single market policy-makers also have to square the circle of liberal and free markets with robust protection for employees. The social market is after-all the EU model. Lisbon had targets for social protection and so does the Europe 2020 agenda. Social Europe is an important part of the single market but initiatives, like the Working Time Directive, that started under the Centre-Left Jacques Delors have ground to a halt. Even a review of the Posting of Workers Directive which was supposed to beef up rules to prevent social dumping has been kicked into the long grass. Greek protesters certainly can’t see much evidence of Social Europe even if their living standards have been supported in the past – like many others - by the single market and EU funding. The single market is, of course a double-edged sword. It has proven that it can generate growth but it is also a threat to the social safety net which distinguishes the European model. UK PM, David Cameron believes that the austerity measures that only pile on the agony in Greece may be necessary to save the Euro – and Greece - but they must be reconciled with the growth-centred focus of Europe 2020. But the Commission is already ahead of Mr Cameron. President Barosso had asked former Commissioner (and now Italian premier) Mario Monti to effectively write the Single Market Act and this year the EU institutions are focusing on 12 key areas that will get the single market motoring again. One area is public procurement. Despite existing EU fair play rules, well over 90% of public sector contracts are awarded to a company from within the same Member State. Interestingly, the UK is the most open to European bidders. Interesting also that the UK has one of the best records in implementing single market directives. Maybe its not the bête noire of Europe it pretends to be? Maybe, the UK is the poster-child of the single market. While France and Germany are increasingly preoccupied with the Eurozone, maybe – just maybe - the British can help steer the single market to growth and the UK can assume a leadership position once more in Europe.